The San Juan Islands feel as if they’re worlds away from the mainland, though they’re easily accessible via a scenic ferry ride of seaplane from Anacortes, lying of northern Washington’s mainland coast between Seattle, Vancouver B.C. and Victoria B.C.The most populous island in the archipelago is San Juan, which offers lots of things for visitors and San Juan Island waterfront real estate owners to do along with a host of fine restaurants, unique shops, galleries and museums, particularly in the charming town of Friday Harbor on the east side of the island, which also hosts the ferry terminal. Roche Harbor Village is situated at the island’s north end and offers many opportunities for getting out on the water as well as an airstrip, marina, eateries, grocery store, boutique shops and a park. An outdoor lover’s dream, some of the activities available that will allow you to take advantage of the spectacular scenery and the glistening waters all around, including kayaking, boating, sailing, fishing, whale watching tours and more. You can even visit an alpaca farm and a lavender farm in addition to shopping for fresh island produce and other items at the farmers market. As the island sits at the center of the Olympic Mountains rain shadow it enjoys nearly 250 days of sunshine a year, and only half the annual rainfall of Seattle, making it deal for getting outdoors year-round. In fact, you’ll find that walking, biking and kayaking are just as popular as driving for getting around, if not more so. When searching through San Juan Island waterfront real estate you’re likely to find a diverse range of options, with everything from cozy, value-priced cabins to luxurious estates with thousands of square feet on huge lots with plenty of privacy for enjoying all the breathtaking scenery, and upscale features like an indoor pool or even a fruit orchard. Take advantage of our industry-leading tools to make your property search as easy as possible and be sure to register for a FREE account so that you can receive email alerts whenever new San Juan Island waterfront real estate for sale hits the market. 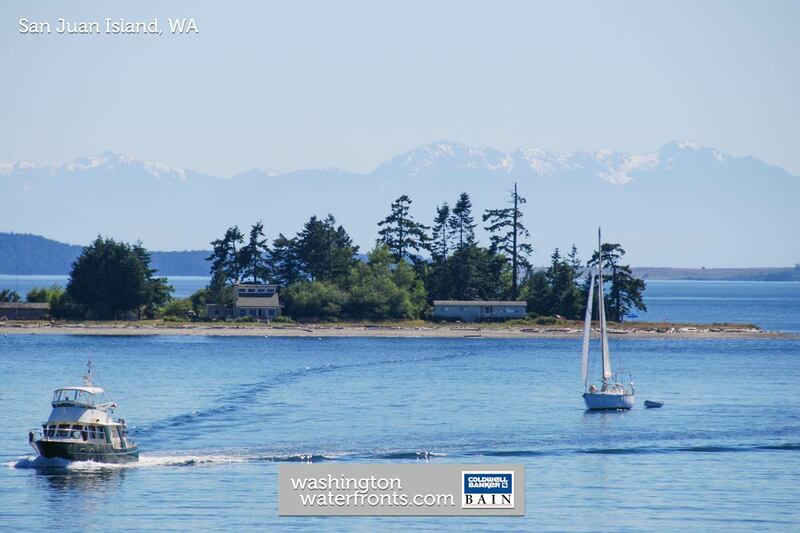 If you're seeking to sell your San Juan Island waterfront property, contact our Waterfront Specialists directly for a comprehensive listing analysis and to learn more about the cutting-edge marketing strategies we'll use to sell your home quickly for top dollar!